Here’s something we can all agree on: There’s almost always a time-crunch when it comes to writing proposals. Maybe the client doesn’t give us much lead time (two weeks; a week; three days). Or maybe the RFP sits on someone’s desk for too long before a decision is made to go for it. Whatever the reason, the trick is to make the most of the time we do have. Drafts. You should have at least two, and three is ideal. Artwork. Graphics take lots of time, and can’t be put off until the end. Set set dates for drafts of the drawings, charts and photos you plan to use. Reviews. You need to review the drafts; each time you review a draft the proposal will improve. Production activities. This includes final word processing, photocopying and binding. These will include writers, reviewers, key technical people whose expertise you will draw on. Also include any support staff you will need to put the proposal together. Finally, consider your sub-consultants; do you want them involved in the planning or writing? If so, contact them and get their commitment. Figuring out early on who you want to work on the proposal increases the chances that they will be there when you need them. Who is going to do what? Make sure you 1) figure that out and 2) let them know! The key player in a proposal project is the proposal manager. This person (he or she should be the eventual project manager) runs the entire show. The PM should have authority to make decisions about who will serve on the proposal project. A proposal is a project! Most projects have kick-off meetings to make sure everyone’s playing to the same tune. In the meeting you hand out the schedule, give proposal assignments, talk about your proposed approach. 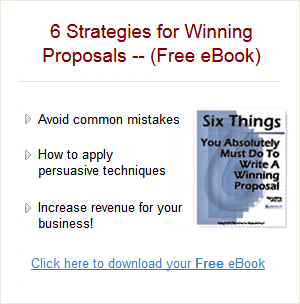 If you have a proposal strategy (and you should!) make sure everybody at the meeting knows what it is. Your plan does not have to be complex. For short proposals, it means sitting down for an hour or so to figure out who needs to be involved and what the timeline will be. More complicated proposals, of course, require more planning, but it will pay off in the end. If you don’t make a project plan—and stick to it—you will likely run into problems. Like key people not being there when you need them because you never checked to see if they were available. Or the drawing that isn’t ready as you’re prepping the final draft to be photocopied (“I thought you were going to do that.”). You wouldn’t run a technical project without a plan. Your proposal projects are too important to your firm to conduct them without one.